Almonds health benefits are at the top of the tree as far as being the healthiest nut we can eat. Facts are, the 90 percent of the fats in almonds are unsaturated, and the nuts are high in protein, fiber, calcium, magnesium, potassium, vitamin E, and other antioxidants. Almonds had been considered in the past too fatty to be a healthy snack, but studies have shown that eating three ounces a day, decreased blood cholesterol levels up to 14%. Other researches have shown links between nuts (especially almond) consumption and lower risk of cancer, diabetes, Alzheimer disease and other illnesses. 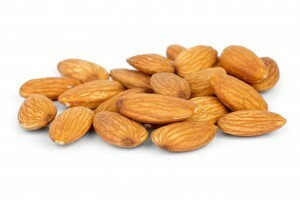 The folic acid in almonds is believed to help lower levels of homocystein, the amino acid that is thought to contribute to the buildup of fatty plaque in the arteries. This nut, also help prevent osteoporosis and regulate blood pressure.